Paul you don't have to defend yourself, I do it and most of the others reimport horses too, nothing special. why did you not just ask me instead of going down this route that just sounds really snidey. Good lord Paul, relax. I asked my original question and you ignored it but you did answer another one. I was just disappointed you didn't answer my question. Thanks everyone for the answer. Also Paul, I think I've asked this before a long time ago and I can't remember the answer - 6 of your horses have a "li" at the end of their name and one has a "li li". It's something to do with the transferring them I think? Why not use the original horse? How do I get a "li" at the end of my horse's name? the older posts when you said i did not answer your question. there was a need for spikey comments Sirius which i see you have now edited. now feeling there is an agenda behind this. I assure unequivocally I am not casting aspersions about cheating. Not in any way. You are being extremely paranoid about this. I then later handicapped some of your horses and the kit showed their distance indicator as being 4fur off the races they were in. I thought maybe you might have entered them in wrong distances by accident and didn't notice. I was trying to be helpful I thought. You got really defensive about it. 2. As explained above - I was just very curious as to how the name thing happens because I have never done it and I have seen it for years in the league. How does that happen? How can I do it? A simple answer to how it comes about was all I wanted. I again apologize if you read into it that I was making accusations. Maybe afford me the same courtesy for doing the same? I think u being over sensitive Paul, he only asked a question and it goes to show we all breed differently. you do as i regularly post. the rest of the season I think they are just a very poor bunch. I'd like to apologize for misunderstanding your intentions and lets put it behind us. Cool. No worries and thank you. I was mass breeding once and i hate trying to think up new names. Eventually i started generating horses with numbers in their name. Like "Bad Apple 1" and "Bad Apple 2" ect. I never thought numbers were possible in a name, but seems they are. 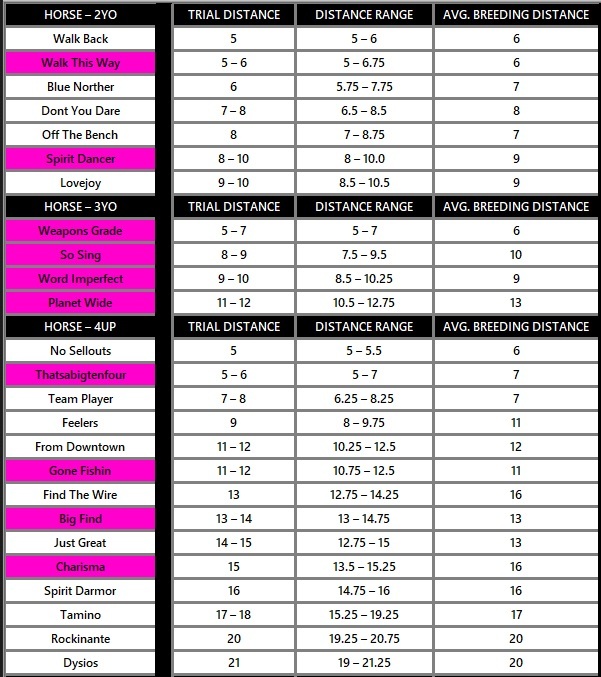 I find the distance indicator be just that an indicator I have horses of all ages who do their best work outside the noted distance. In the most extreme example a 1.2m rated horse who was a 5f trial horse. All mine fit the numbers, I wish we could change that ourselves because over jumps in SO7 it is terrible. I breed my first few stayers over jumps this week and they are 4 milers like it says but when u put them in the transfer pool it keeps putting them as 3 milers. It's one of the things that drives me up the wall over jumps. When i was trialing i noticed a trend with distance indicator. Long story short, if the stamina didnt match the "Average Best Distance" it never seemed to run really good. Sure the stamina matters but my best performers have stamina that matches the "Average Best Distance". I have a theory on all of this, i'd write about it in a new thread but as SO6 seems to be on the way out i dont see the point. Edit: Im talking about 3yo's that have been allowed to mature. Stamina will sometimes increase later in the season, especially if its low at the start of the season. Here's a small sample of distance indicator stats from what I collected before the season about my team. I use the distance filter when trialing to reduce the number of available horses to choose from because I have way too many horses. Horses out of the filter range I'm sure can win in the filter range. 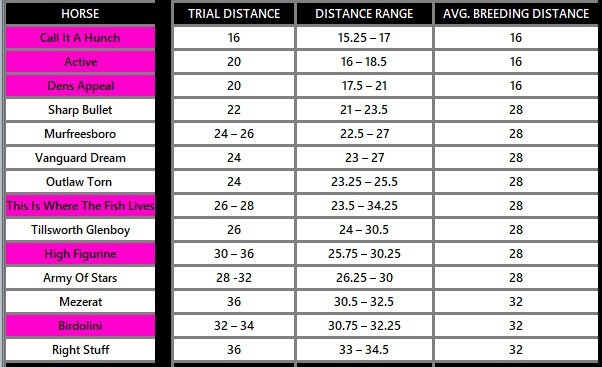 Trial Distance is the distance they were most competitive in my trials. Distance Range is the range the filter applies. Average Breeding Distance is what it says in the CK. Most fit within the range. I remember determining the range for This Is Where The Fish Lives and asking when does this range stop??? 23.5 to 34.5 is a freak compared to all the others. In my experience it just depends how you breed, if you stick to breeding pairs that have the same distances you get consistency in the offspring, if you breed all over the ranges you will sometimes get offspring that show one distance but run best at another. I used to mix everything up regularly but don’t anymore and thus reduce my trial headaches as I only go 2f either side on the flat and 4f on the jumps. I also found the odd ones are never really all that good.